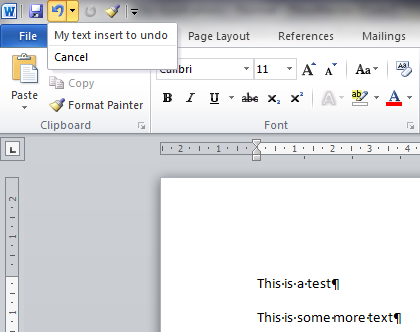 One of my fave features in Word 2010 is the new custom undo records. It allows you to group your changes via code into blocks that can be undone in a single go – plus you can name the records. If you ran this sub, and then went to the undo option, you’d see the 3 entries for each line of code that changed the document. Now, here’s the same sub using a custom undo record. And after running that code, here’s what the undo options look like. You can also do nested undo records if you like, not that I’ve had a real need for them yet. But I may do very soon as I’m just about to do some work where I need to audit changes and have multiple levels of rolling back. Fingers crossed I’ll be able to do it all with nested undo records. 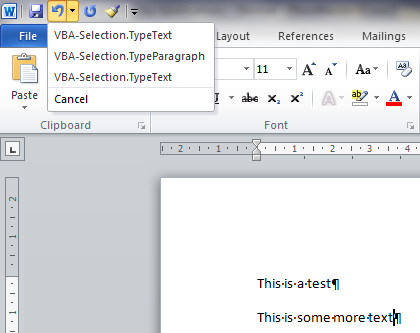 Have you ever tried to get the edit time from the IManDocument or NRTDocument objects within Autonomy WorkSite? There’s the AccessTime property which returns the date plus time, but the EditDate property is just the date, and the time part is missing (set to 12:00am). So how do you get the date and time? Turns out you need to use the GetAttributeValueByID method instead, which exposes both the EditDate and EditTime values, so you can just add them together to get the full DateTime value.